Sailing activity has been so much fun and informative last weekend. So, next weekend we decided to do it in two days, both Saturday and Sunday. Please indicate which day you like to join. Sailing time is usually from 13: Protected content , but we might change it to a later hour depending on the weather. The introductory session is for 2 hours on each day. Total maximum 8 people per boat. 150tl per person for the boat rental and instructor fee. We are going to take the basics of "How to Sail" and have fun and socialize. We will hang out at the Protected content in Fenerbahce afterwards. Sailing has become an important sports, an adventure, not a luxury. Any level package Protected content , will be for 12 hours total 4 sessions. The group packages will start on the 3rd week of March. We can conduct the sessions either on weekends or weekdays. After the 2 hours session, you’ll understand how a sailboat works, the terminology, and the common commands used to steer one. 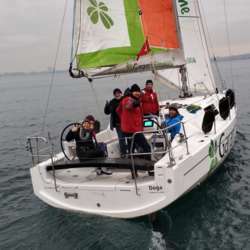 The introduction session will be guided by a very professional sailor who won national rewards for many times. Special outfit will be provided during sailing for protection. The boats are Protected content Protected content Azure33. They are CE certified.